How do we grow stand up paddle racing? This seems to be the burning question of every SUP athlete, retailer, race director and manufacturer. After years of steady growth, stand up paddle race participation will inevitably level off, if it has not done so already. Don’t worry, the future of SUP racing is bright! There are numerous opportunities to proactively get more people into stand up paddle racing right now. Use the tips below to build your local SUP racing community and help the sport continue to grow. Help ensure a bright future for these SUP racers. A great way to get people excited about SUP racing is to get them excited together! We are social creatures, paddling by ourselves is fun but doing it with others is even better. New and experienced paddlers will benefit from joining a SUP training group. Starting your SUP training group is easy. Pick a meeting location, pick a day, show up, paddle together. Simply start the group and then allow it to grow. Groups can meet as little as once per week or as much as every day. Pick a location that has easy access and a time that works for a majority of the group. There is no better way to start the day than with a solid SUP training session before work or to end the day with a sunset sweat. Paddling in a group will provide structure to your SUP training sessions, push you to improve, create motivation and keep you safe on the water. Keep in mind that training groups are not just for adults. 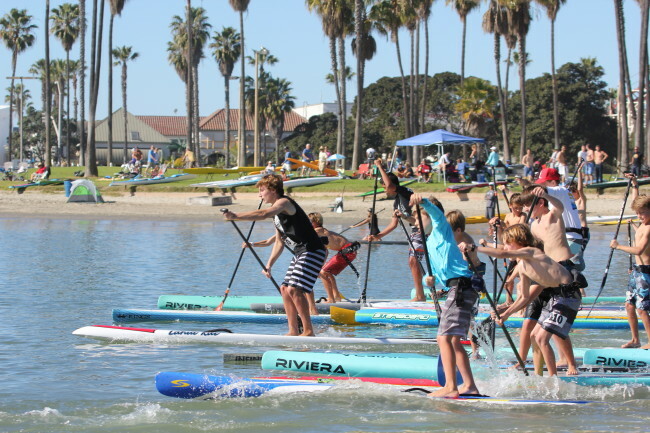 Starting a junior SUP training program is just as important for a healthy SUP racing future. Structure. Make sure the group has a plan with short and long term goals. SUP training sessions should be periodized so that the group is training smart and not simply paddling aimlessly. A variety of workouts will help you improve faster and make each SUP training session fun and interesting. Don’t have a plan? Read this article on forming a training plan and then use these sample workouts once you get going. Improve. You are much more likely to push harder in a training session if there is someone next to you trying to finish first. Paddling with faster athletes can push you to improve and help you learn from their skills and experience. Group SUP training will also help you practice skills like drafting, an important part of SUP racing that is hard to practice alone. Motivation. It’s easy to find an excuse to skip a week of training or to go slow during a sprint workout. There is nothing more motivating than having someone encourage you to push harder during a difficult workout. It’s a lot harder to skip training when someone is holding you accountable during each training session. Safety. Paddling in a group can make you more visible to boaters and provide a safety net on the water. Group members can assist in the event that you sustain an injury or get yourself into trouble on the water. It might seem obvious, but hosting a SUP race is one of the best ways to grow SUP racing. There are hundreds of SUP events held around the world each year. An important way to get new and existing paddlers to attend big weekend events is to host smaller SUP races during the week. Weekly paddle races are the perfect initiation into SUP racing. With a low cost of entry, variety of courses, short distances and convenient locations, the possibilities for weekly SUP races are endless. The main idea is to simply expose new and experienced paddlers to more opportunities to get involved in SUP racing. Participating in a big event with sponsors, cash purses and people watching on the beach is an intimidating introduction to SUP racing for any athlete. Keep your smaller races inviting with short distances, unique formats and simple awards. For example, a weekly race can include the choice between a 3-mile and 1-mile course with team relays at the end. Use the SUPAA rulebook and website for good resources on what should be considered at each race. Awards can be as simple as calling out the winners while everyone gathers around or you can give small trophies from the the dollar store. Don’t stress about making your race an ‘event’ in the sense that it needs to be a big production. Times can be manually recorded with a clipboard and stopwatch. An easy way to keep track of placing is to number wooden popsicle sticks and hand them to competitors as they cross the finish line. If you missed a competitor or got someone wrong you can simply ask for their popsicle stick to check the order in which they finished. At the conclusion of the race meet up at the local watering hole for a drink or have some food on the beach. Much like the SUP training groups, weekly races are a great way to build community, meet other paddlers and share the sport with new people. Paddlers generally have a natural desire to share the stoke of stand up paddling as soon as we get hooked on the sport. We teach our family and friends to paddle and tell anyone we can about how fun our new addiction is. Once new paddlers master the basics they decide how they will spend their time on the water. The possibilities for new adventure include SUP racing, SUP surfing, SUP yoga, SUP fishing, whitewater SUP, SUP expeditions, SUP fitness or simply paddling. The beauty of our sport lies in the variety of ways in which it can be played. SUPAA is focused mostly on the SUP racing side of the sport but however a paddler chooses to spend their time on the water is fine with us! SUP racing will naturally continue to grow as more people are introduced to stand up paddling. A SUP yogi might decide they want to compete in between their downward dogs, while a sunset cruiser might learn that going fast is a good way to get a better workout. So share the stoke. Start a SUP training group or host a weekly SUP race series. These simple steps can help SUP racing continue to grow for years to come. We would love to hear from you! sShare your thoughts and let us know what ideas you have to help SUP racing grow.